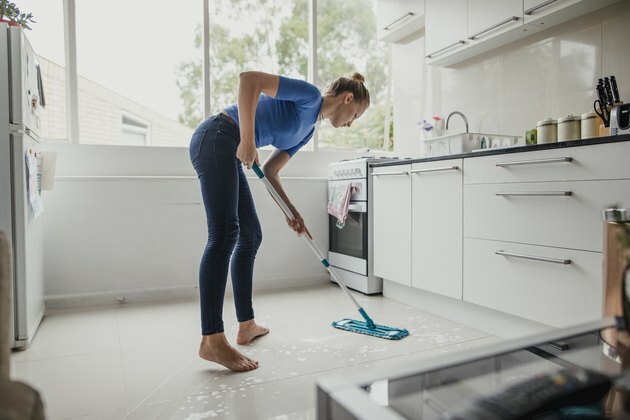 If you have children or pets, or if you're simply concerned with the safety of the chemicals you use in your home, you might be considering an organic grout cleaner. It's important to scrub grout periodically with a cleaning agent of some sort as it can pick up dirt, dust and germs. However, many organic cleaners are just as effective as commercial chemicals. One approach to disinfecting and brightening grout is to make a cleaner yourself. Taking care to avoid cuts and your eyes, pour one-half of a cup of baking soda and one-fourth of a cup of hydrogen peroxide into a spray bottle. Mix the two thoroughly and wear rubber gloves when you apply the solution to your tiles. This cleaner will help to gently scour away grime and will also clean and brighten the grout. For an extra boost, add 1 teaspoon of liquid dish soap to the above mixture and combine well. Spray the liquid onto the grout and let it sit for five minutes before you wipe it away. Be sure to remove all traces of the grout cleaner when you're done. This homemade cleaner is particularly useful when cleaning shower grout, which may be more prone to accumulating germs or mildew. Another option for cleaning grout is to use a spray bottle containing white vinegar. Use a toothbrush to work the vinegar into the grooves for an effective brightening effect. After all of your efforts, you'll want to keep your grout looking new for as long as possible. Be sure to vacuum tiled floors frequently so that dirt and hair don't build up and get ground into the grout over time. Wiping the area with a damp paper towel from time to time can also help to pick up debris your vacuum might miss. Using a quality grout sealer at least once a year is also a fantastic way to ensure the longevity of your tiling. This sealant helps to protect grout from dirt and other things that cause discoloration over time. Products like Zep Grout Cleaner and Simple Green All-Purpose Cleaner are popular choices on the market that limit harsh chemical use. Simple Green, for instance, is nontoxic and biodegradable. It doesn't claim to be organic, however, but the manufacturer does state that it's safe for use around children and pets. It's effective on a variety of surfaces, including fabric, carpet, upholstery, sealed or painted wood, stone, tile, fiberglass, metal, plastic, rubber, brick and concrete. You can use it on the grout between your tiles in most instances. Zep Grout Cleaner is bleach-free but doesn't make any claims about being organic or safe for use around children or pets.